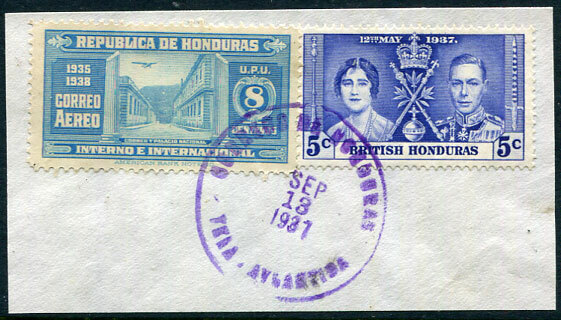 (SC-1a) in purple ink dated A/AP 14 22 on KGV 2c (SG.121). 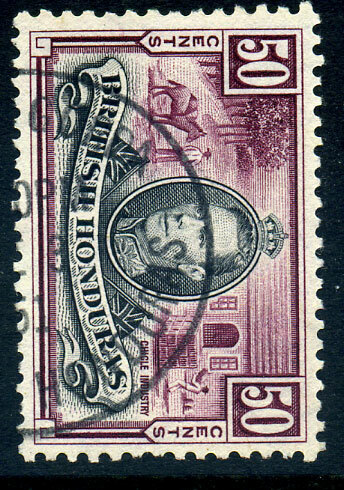 in purple ink dated SEP 13 1937 on combination Republica De Honduras 8c and British Honduras KG6 5c Coronation piece. Black boxed 3-line "P.O./RECEIVED. 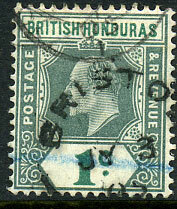 (date) handstamp in combination with part BELIZE A/JU 7 cds (signifying some sort of post office combination use) on KGV 10c (SG.132). 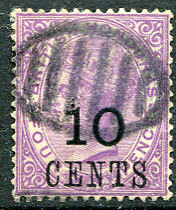 the killer portion of the STANN CREEK rubber duplex TRD on 1888 "10 CENTS" on QV 4d mauve (SG.40). 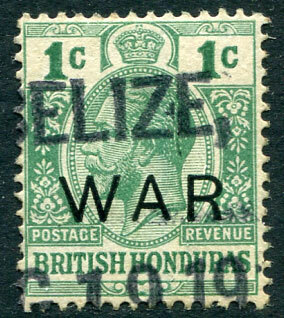 pmk'd Belize NOV 11 1918 on the day World War One ended on KGV 3c WAR (SG.120), nice conversational display item. 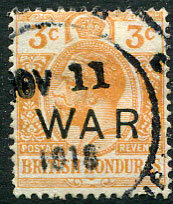 (D18, introduced after Post Office fire of 17 August 1918), temporary 3-line dated (AU)G 19 19(18) on KGV 1c WAR (SG.119) with date-line 5½mm high (with possible differences in typeset of wording BELIZE). 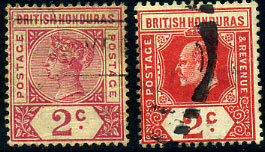 unlisted by David Horry in his "Encyclopaedia of British West Indies Postmarks - King George VI" and part dated 2.00PM/-E 3 51 on KG6 50c (SG.158). (SC-1a) sideways down C/15 AP 16 on KGV 2c (SG.102a). WITHOUT DATE SLUGS on KE7 1c (SG.84a). on QV 2c carmine (SG.52). (SC-2) A/AU 10 12 on KE7 1c (SG.95). 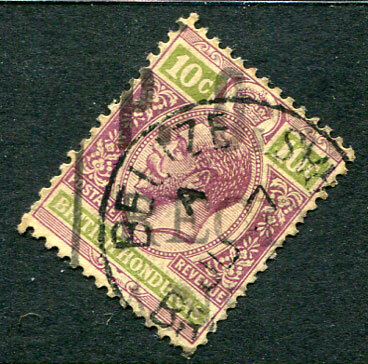 (MBS) small pert strike on 1905-06 KE7 1c MCA wmk (SG.84), washed colour. (SC-1a) C/JA 12 03 on QV 2c (SG.52). on QV 3c on 3d (SG.38), toning. 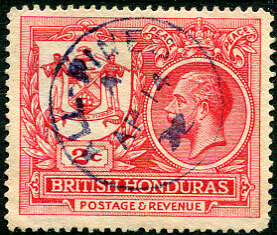 on QV 5c (SG.54), creases. (SC-1a) C/AP 10 02 on QV 2c (SG.52), base perf. toning. 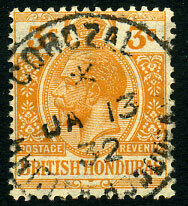 */JA 13 32 on KGV 3c. 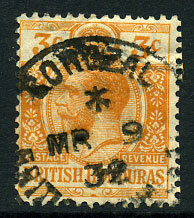 */MR 9 32 on KGV 3c. JY 3 05 on KE7 1c (SG.84).